Designed by Colombian designer Nelson Ayala, the “NatoStation” (NS) is a virtual reality simulator wherein the user experiences visual, acoustic and sensory sensations similar to the prenatal environment, i.e. life inside the womb. Featuring an ergonomic and dynamic egg shape, the NS lets the user assume a position comparable to the fetal position, so he/she could virtually escape the atmosphere for a moment and relax in comfort. To experience the calm seclusion, you need to wear a helmet that includes a device to scan your initial brain waves and determine the level, speed and intensity of the stimulation experienced, through video technology, during the course of the session. The helmet emits Mega Brain strobe lights that change the brain frequencies to 8 Hz low alpha waves, epitomizing a state of deep relaxation. When the screen inside the helmet begins to light up slowly, reflecting amorphous shapes, the user’s heartbeat is monitored to synchronize the projection speed as well as the reproduction of the sounds from the mother’s belly (heartbeat and intestines). 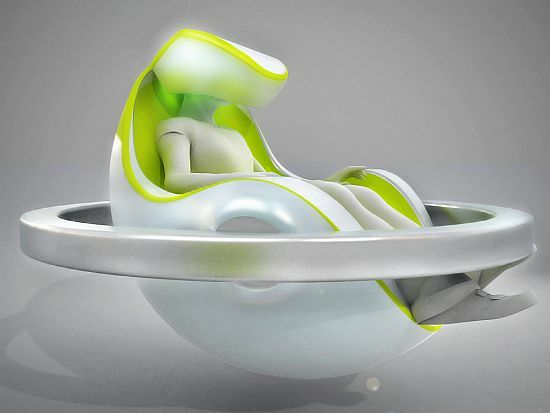 As the simulation initializes, the heated seat activates to replicate the warmth of the womb, and it begins to rotate in a motion resembling fetal movement. The user begins to feel, hear and stimulate a prenatal state, thus achieving a disconnection from reality, returning to his/her unknown primary environment. The session ends with the chair in a baby’s birth position, deeming this final stage as New Birth. The helmet also includes noise-canceling headphones that contain sensors to scan brain waves to be projected on a screen, while the chair is attached to a mechanical loop that generates the orbital rotation. Moving the user far away from the sensory overload of the day-to-day grind, the NatoStation provides an incredibly unique and relaxing experience.